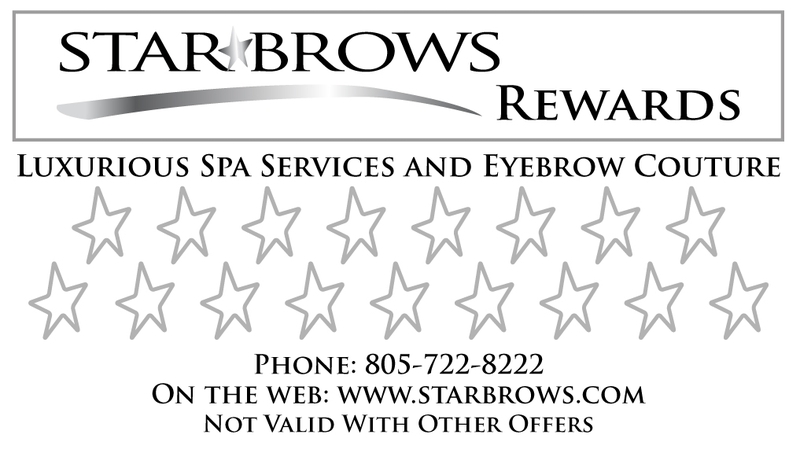 I’m excited to announce a new perk for being a loyal Star Brows customer. You, after all, are the Star at Star Brows! Starting September 1, 2010, you can earn FREE spa services when you buy any skincare or cosmetic product at the spa. It’s called Star Brows Rewards, and your part is as simple as 1-2-3. 2. Subscribe to my Star Brows Blog, where I give you beauty secrets, share health and wellness tips, and keep you up to date on everything that’s happening at Star Brows! 3. Make a purchase of skincare products or cosmetics at the spa. I’ll give you a Star Brows Rewards punch card. For every $10 you spend you get 1 punch, which is worth $1. Spend $100 and you get $10 in Rewards! I’ll redeem your Rewards for a spa service Enhancement when you come in for a regular service. Service Enhancements are listed below. They are also in my brochure and on the Star Brows website. Update: It gets even better: I’ve added a Monthly Product Feature which offers double Rewards! That’s 20% in Rewards. Waxing Enhancements – Eyebrow or Eyelash Tint, Star Massage, Face Part Wax (chin, lip, cheeks, nostrils, etc.). Facial Enhancements – Power Pumpkin, Salicylic Acid, or Primary Alpha Peptide Resurfacer. Massage Enhancements – Raindrop Therapy, Deep Muscle-work, Aroma Therapy/Hot Towels. Q: What if I don’t do Facebook? A: If you give me your email address, or send Star Brows an email, you’ll get periodic updates to the Star Brows Blog and other special offers. Q: Can I redeem my Rewards for regular services? A: Rewards can be redeemed for Enhancements only, when receiving a regular Spa Service. Q: What if I only have $2 in Rewards? A: Redeem as many (or as few) as you’d like — anytime! Q: Can I get a Massage Enhancement when I get an Eyebrow Design? A: Yes. Although some of the Enhancements are easy to do in conjunction with any service, some aren’t. Chemical Peels, for example, need to be done with a Facial; Raindrop Therapy with a Massage; and Lash Tint with a Facial Waxing service. Q: How much do Enhancements cost? Q: Will my Star Brows Rewards expire? A: No. Your Rewards will remain valid until used. At Body Rhythms Spa and Salon in MN, I used this program very successfully. Customers were able to enjoy more great spa services while using the products they loved! I’m pleased to offer it again at Star Brows.